The Clients: 100% Mambo is an Australian based fashion label known for it's unconventional design. 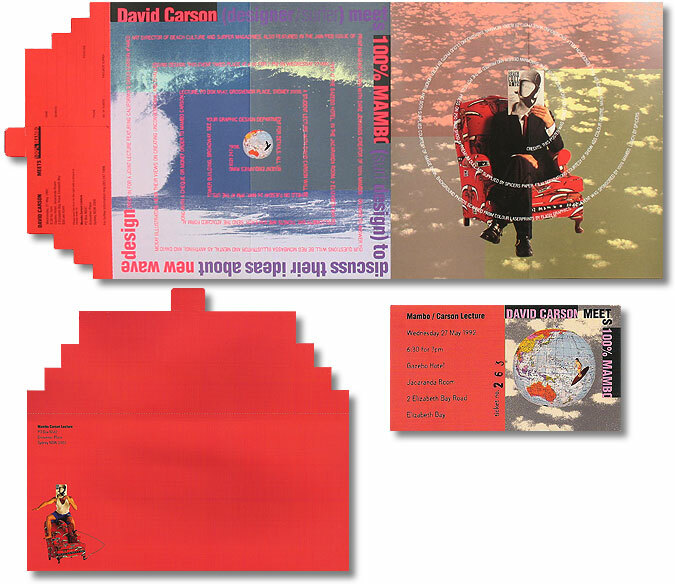 David Carson, the former art director of Beach Culture, Surfer and Ray Gun magazines, is considered one of the world's most innovative and influential graphic designers of this era. The Brief: To design a promotional piece for a forum bringing together Australia's and America's best known surfing designers. Awards: Graphis Design 94, Featured in David Carsons' book 'The End of Print', Australian Writers and Art Directors Annual, Australian Graphic Design Association National Awards, and Design Down Under #3.